Although the show has been off the air since 2003, Buffy the Vampire Slayer Halloween costumes are still hugely popular, thanks both to the show's ongoing cult status and continuing story lines in comic books. A good Buffy costume should be instantly recognizable for years to come. There are numerous great options for Buffy costumes. The show's variety of characters makes it a perfect choice for couple or group costumes. If you want a Buffy-themed costume, it helps to first narrow down your options. And of course, Giles, Buffy's Watcher, trainer and father figure. He's stuffy, British, obsessed with books and an excellent fighter. 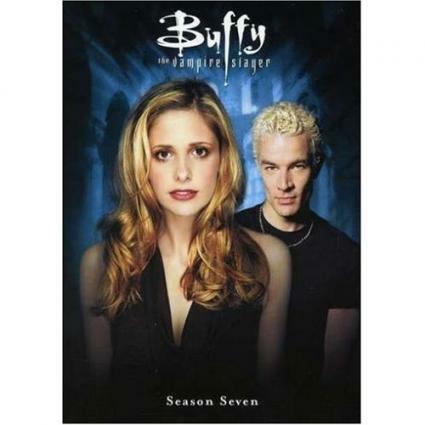 Although there were many villains, both major and minor, throughout the show's run, the most popular for Buffy the Vampire Slayer Halloween costumes are the vampire couple Spike and Drusilla. Spike's character underwent drastic changes during the show, but his look was always the same: bleached blond, punk hair and a long black leather coat. Drusilla preferred Regency-style dresses, had long brown hair and liked to disfigure dolls. You can also make a nice trio of villains by adding Angel, who became bad in season two. He always favored black with a leather jacket. Many of the villains were demons who would require elaborate makeup to reconstruct, such as the Master and Adam. Others, such as the Mayor and Glory, are too nondescript outside of context to work as costumes. However, a very fun choice of villain for a trio is the Trio - Warren, Andrew and Jonathan, the nerds who styled themselves as Buffy's "arch nemeses." They all dressed as typical geeks, in T-shirts and baggy trousers, often with open shirts on top, like Xander. The trio had no end of fun props, including Star Wars memorabilia and bizarre weapons of their own design. This would be a more obscure Buffy the Vampire Slayer Halloween costume choice, and might work better paired against a Scooby group, but it is a fun and easy option if you have some handy toys. If you are going as the Trio, an interesting option for a female member of the group costume would be Dark Willow, who is driven to hunt the boys down after Warren kills Tara. Dark Willow wears black, with black hair and black veins covering her face. She also has pure black eyes. Buffy costumes must be put together with some forethought and effort. The good news is that little sewing is required. The bad news is that if you want to do it right, you need to do the research. Fortunately, there are no end of images available, both online and in related books. Set aside a lot of time for research - just like the Scoobies always did!